What is an autosomal grouping? How Do I Compare my Family Finder/Autosomal Results on the Smith DNA Project? 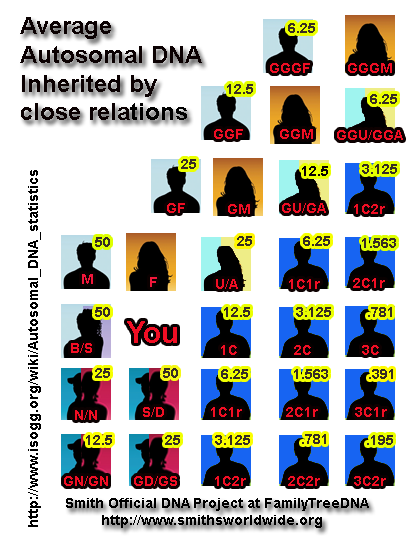 Here's a chart we have done for the Smith DNA project showing the percentages of autosomal matching among generations. Had YDNA tested at FamilyTreeDNA but not part of the Smith Official DNA Project? Does both a brother and sister have mom’s mtDNA? I’m in a grouping- Can I tell a match from comparing TNG trees? How Do I Compare YDNA Markers on the Smith DNA Project? Did you get DNA testing done?